I have no intention of this becoming solely a knitting blog, but since I’ve started writing, I seem to have had a lot more interest in and motivation for knitting. I’ve made a good start on the left front panel of my cardigan, though I had to cast on several times before I was happy with it. I could do with a lot more practise on that I think. This is the pattern I’m working on, by the way; Berroco’s March Basic. The stockinette is pretty mindless, but I want to be comfortable and confident with the basics before I move on to anything more complicated. I definitely need to work some more on my technique; I don’t think I’m controlling the needles and yarn in the most effective way at the moment, but it’s difficult to know how to adjust my position. It took me a long time to get it right for crochet, so I guess I’ll find a way that suits me over time. I also need to learn some more useful basics like how to correct mistakes and what to do if you need to rip back a couple of rows without ending up ripping the whole thing back to the point of casting on again. Crochet is definitely easier in that regard. I’ve just bought myself some interchangeable circular needles on a bit of a whim. I had a pattern in mind, but have just realised that I don’t have enough of the yarn I was intending to use for it, which doesn’t really help! I don’t have much of a stash; lots of different colours of Stylecraft Special DK, which I’ve used for various crochet projects, and one or two balls of different things that I’ve bought, usually because they were reduced and who can resist a bargain! ?, but more often than not, I’ll only buy yarn for a particular project. Meanwhile, I haven’t picked up my crochet hook for weeks, though I’m onto the border rows of my current project, and I’ve not been near my sewing machine since I made myself a crochet hook roll a couple of months ago. I’ve found a little more time for reading recently and am working my way (very slowly) through The Book Thief. My house and garden are getting a lot of attention at the moment as we prepare to do some major work on both. And I’m hoping to get along to some pre-audition workshops over the next week or two for a theatre production that I’d like to get involved in. It’s also a new group (to me), and the production is a musical, which I’ve not done for over ten years, so I am a little daunted, verging on slightly terrified. Wish me luck! Woohoo! I’ve cast off the back panel of my cardigan! This is my first ever real knitting project – I’ve not even made so much as a scarf before – so I’m really quite excited and pleased with my achievement. Now I need to take the final step and cut the yarn, which always feels like the point of no return, as up til now I’ve always had the option of frogging everything and starting something different. But the panel looks like it’s the right shape according to the diagrams and I’m pretty sure I’ve followed all the instructions and dimensions as closely as possible, so I think it’s good to go. The next job will be to block it, which is another new venture for me. I bought some of those interlocking foam mats the other day, specifically to use as blocking mats, though they’ve already been purloined by my boys for their own amusement. Not that I object too much to that – they are designed for kids to play on after all – I just hope I can steal them back for long enough to get the blocking done. 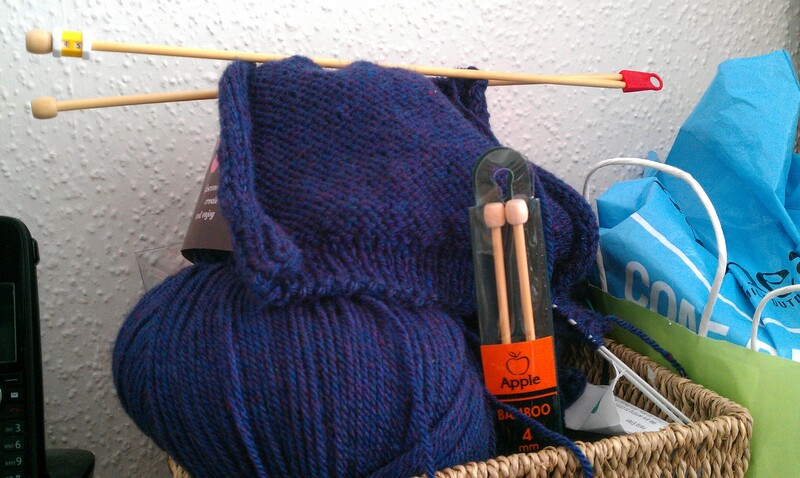 So, I have taken up the knitting again and it’s going well so far. I’m working my way up the shaping of the armholes and it’s working up faster than I expected. There is another slightly daunting hurdle coming up, but another Youtube video will set me on my way. I’ve been reading through the archives of a knitting blog and have seen some beautiful patterns. I also think I’d like to try out continental knitting. I’m working English style at the moment, and it seems like there’s quite a lot of movement in it which could be streamlined so I can work a bit faster. I’ve spent most of the bank holiday weekend out in the garden which is in need of a lot of work at the moment. I’m not a gardener by any means and we’ve rather let things run wild since we moved in here a few years ago, so we’re just trying to get things under control and then we’ll work on making it more suitable for the boys to play in. We cleaned out and moved the sandpit at least, which Pumpkin was delighted by, and even Pickle enjoyed a brief sit in it. They’ll both enjoy it so much this summer, I’m sure. Since writing my post about knittng, I’ve been itching to get back to my cardigan and find out whether the point at which I stopped really is a stumbling block, or just a small hurdle I can easily get over with a bit of time and patience. One of my main reasons for starting this blog is to practise writing regularly. As someone who often shies away from doing anything unless it is the right thing, I am hoping this will encourage me that to write something is better than to write nothing; to knit or crochet or bake something is better than doing nothing. So, there are my ineloquent thoughts on the matter. Now I’m going to dig out my knitting bag and a pattern and find a Youtube video to help me over this little hurdle. It’s time to knit on.